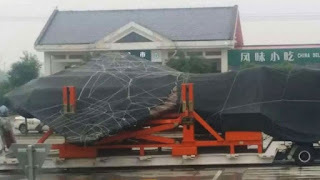 A new prototype of the J-31/FC-31 may have been spotted being transported by truck like the first was in China. Japan considers air superiority fighters to be the most important. Sukhoi has stated the testing for the T-50/PAK-FA is nearly complete. The testing may be only the first round. The first deliveries of the PAK-FA to the Russian Aerospace Forces is set to be in 2018. The US Air Force is seeking to reprogram almost $24 million to work on the 'next generation air dominance' platform. The most up to date F-22s are fighting in Syria. SecAF James is NOT thrilled with the idea of restarting the F-22 line. Sharing data with allies on the F-35 presents problems for the US. The USAF is hinting IOC for the F-35A may come faster than people expect. Russia claims its 'Sunflower radar' can detect the F-35. The first F-35A has flown to Britain. USMC F-35Bs have been cleared for flight at Farnborough. Video of the F-35As and F-35Bs crossing to Britain for the airshows. Video of the F-35 taking off in Britain. Construction programs are going to make it tough for the F-35s in Britain. The F-35s are showing off well at the British airshows currently. Some pontificate on the import. The next at sea qualifications for the F-35B will take place in October before being tested aboard the Queen Elizabeth class. The British are about to start training F-35 pilots. Lockheed is warning Canada about its industrial participation if Canada does not buy the F-35. Some are not so sure the F-35 is a good idea to say the least. The F-35 faces an uphill fight for international sales past the current partners. Pratt & Whitney got a $1.5 billion contract for F-35 engines.